We offer daily kids’ activities from 4:30 p.m until 8:15 p.m. 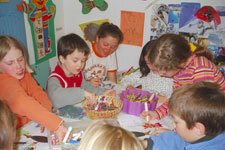 Kids participate in games, arts & crafts, movies and other fun. There are different activities daily and your kids are welcome to come and go as they please. We are also happy to receive requests from kids for après ski entertainment.